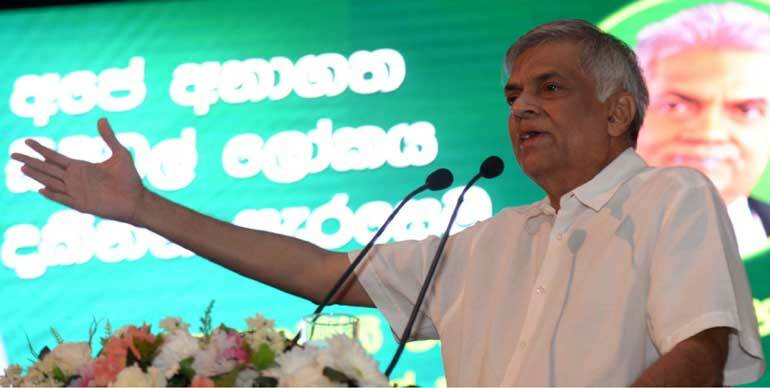 Prime Minister Ranil Wickremesinghe yesterday said his party came to power to build a better future for the people and pledged to provide a “sound source of income” to the youth. Speaking during the United National Party (UNP) membership drive in Badulla on Sunday at the Uva Provincial Council auditorium, the Prime Minister said the present government works to “fill the pockets of the public, to provide a house and a land to the people” and not to work for henchmen. The Prime Minister said the present government will ally with any party whether it is Tamil National Alliance or Janatha Vimukthi Peramuna for the advancement of the country. He said the unity government was formed to develop the country and prevent one party going against the other party’s development work. “We have formed a national government to ally with everyone to prevent anyone from going against us. All partners in a national government have the ability to share both good and bad. Our desire is to bring all political opponents together,” he said. He pointed out that Minister Harin Fernanado and Minister Nimal Siripala de Silva are working together under the unity government. The Prime Minister pledged to make Mattala Airport active with a movement of 50 aircraft from it daily where there was not a single aircraft currently, and to develop the tourism industry. He said a vast tourism zone will be set up by merging Hambantota, Galle, Arugam Bay and Badulla. Under the membership drive to enroll UNP members, the party aims to recruit 3 million members to coincide with the 70th anniversary of the UNP. At the event the Prime Minister handed over the UNP electronic membership cards under the theme “Ediriyata Yanna Hithana Aya Enna”. He said this while attending a function in Badulla. Minister of Digital Technology Infrastructure Development Harin Fernando also spoke during the membership drive program. Senior party members including Minister Lakshman Kiriella, and State Ministers Ravindra Samaraweera and Wasantha Senanayake were present on the occasion.